I mentioned last year that the Bilski case was going to be heard by the Supreme Court. While the decision was clear that Bilski wasn't going to get his patent on his business process (which was more like a mental process than anything else), the rest of the decision to me is a confusing as a paper on non-linear rheology is to the Supremes. Three separate opinions  were published, one supported by 5 justices except that 4 justices support all of it while Scalia supported most of it except for a couple of sections. Then there was the second opinion, supporting the first opinion  and this was signed by the remaining 4 justices. And then there is a third opinion written by Breyer, who already had supported the second opinion, but apparently not well enough that he still didn't have more to say. This last opinion was also supported by Scalia in lieu of his non-support of the two sections in the first opinion that he didn't agree with. So in the end, it was a 9 - 0 decision, except that at no point did all 9 sign on the the same opinion, and 2 justices signed on to 2 opinions. So does that make it 11 - 0? If you are curious, you can read the opinions here. One thing that this split unanimous decision does make clear is that the lawyers will be guaranteed endless job security. Business method patents are still available, but just not the one Bilski applied for. There is no clear guidance to follow, so it's a free-for-all as to what is acceptable and what isn't, just the way lawyers like it. Why is a decision called an opinion? Why is a second opinion needed to support the first one? Are these people so insistent that the decision has be stated the way they want it? Can anybody name any other case where there are more than one report from the same group of decision makers supporting the same conclusion? This post's title is also the title of a half-page article in "Adhesives and Sealants Industry" (May 2010 issue [*]). The article is pretty short and not too enlightening, focusing on tests being run at the International Space Station. Adhesive tapes however, have gone much much further in space than just low earth orbit. The most famous example would be the duct tape that was ubiquitous on the early manned space flights; it was critical to the survival of the Apollo 13 mission, and even used to patch the Lunar Rover. All of this is small potatoes however to the grand champion of high flying adhesive tape. I wish I could remember the details better, but when I first joined 3M, I worked in one of the tape divisions. Our group received a copy of a letter from NASA stating that portions of an adhesive tape manufactured by our division (I believe it was either 467MP or 468MP) had been used in the construction of the Pioneer spacecrafts and had just recently left the solar system. Now that is a record that won't be beat anytime soon. [*]Yes, this is a month old. I'm still getting caught up after too much time away from the desk with onsite and offsite client visits. From the discussion over at Plastics News, I'm adding Highline PC . Improving this isn't just a one person operation. We all need to work together. It's good to see that something is happening. Let's keep it going. Following up on the last post, the model of “anomalous diffusion” represents the opposite case – one where a “new” model is introduced when the old model works just fine. These equations work quite well for a wide range of systems. The only challenge is knowing "D", the coefficient. While there are various efforts made to predict D from first principles or such, the best situation of course is to simply measure it using any of the various tests developed over the last century. For systems with low molecular weight solvents at a constant temperature, D is found to be constant. Which is great news. It really is. Except for the people who then think that it has to be constant. And when it isn't constant, they fall apart and create a whole new field of research. And give the field a new name: anomolous diffusion. This happens most often with materials diffusing through polymer matrices - as amount of diffusant increases, the diffusivity coefficient changes and the diffusion rates are different ("anomalous") from the case of a constant diffusitivity coefficient. The reality is there is nothing anomalous about it all except the thought patterns behind the research. As scientists and engineers, we all work with models and theories. All of these have their limitations where their predictions break down and become useless. At that point, two options are available A) try tweaking the model with various extensions  or B) throw it away and start from scratch . Consider fluid mechanics. One of the primary assumptions is that the fluid is a continuum - it is the same at all size scales – and that at small size scales, molecules and atoms and the granularity that they provide do not exist. This is a good assumption for the macroscopic world that we encounter on a regular basis. So now you can see my confusion about a new report describing work on viscosity inside of cells, a scale that is small enough that the continuum assumption should break down. At this scale, we can observed localized attractiveness between molecules, largely dispersion forces, but also from dipole-dipole interactions. At the macroscopic scale, these interactions are averaged out to become “viscosity”. This means that at a molecular scale, viscosity doesn’t exist, not unless we want to take the concept to that level and somehow force it in there. This is a great example of overapplying a model. Don’t keep hacking away at it with an old concept like viscosity – develop something new. Look at the specific interactions at that scale and work with that, not some macroscopic average. Bohr didn’t try and figure out how to extend EM laws to electron spinning around the nucleus, he quantized the energy levels and look at the magic that fell out. You could appropriate that old adage about there are “two kinds of people in the world…” As you can infer, I prefer new models in new situations, others clearly don’t. I just never saw the value of worrying about the 3rd virial coefficient. An example is Newtonian mechanics. Einstein threw it out and devised relativity when Newtonian mechanics couldn’t explain what was being observed by astronomers, and Bohr started quantum mechanics because Newtonian mechanics couldn’t explain what we being observed at atomic and subatomic scales. Electrolux has some seriously crazy minds. I've talked before of their concept cooktop, something so far out there that they admits themselves that it will take 40+ years to develop. It certainly will be great PR to be doing something about the problem, and as long as human behavior doesn't change (not going to hold my breath on that one), it will be an endless feedstock stream. As I led in with, this company has one overactive creative mindset, so rare in this day. Ever notice that no one has produced a picture showing you how concentrated the plastic is? If such a picture existed, the environmentalists would be sure that it is seen everywhere (such as with pictures of oil-soaked pelicans). The Garbage Patches exist only on a relative basis - it's not a giant raft of material all globbed together. Granted, some processing equipment could be installed on a large boat, but I think it would mainly be limited to separation steps, possibly granulation, but all that would require a good sized generator powered by fossil fuels. Something that I’ve never felt comfortable with is “environmental stress cracking” (ESC) . Certain plastics, when exposed to nonsolvents and stress, will show crazing and cracking. Take away the stress or the nonsolvents and the problem goes away too. The strangest and most common cases are those involving polyethylene and surfactants. That’s right, surfactants. Keep in mind that polyethylene can laugh at just about any liquid you throw at it, strong acids, bases… Even its solvents don’t cause many problems at room temperature. So how can a surfactant be such a thorn in the side? Common rationalizations  are that the surfactant is able to interrupt the secondary bonding within the material. That’s fine and nice, but then how come ESC doesn’t occur in polypropylene? Another of those terms that is not quite unique enough to avoid confusion with what an untrained person would think it is, much like “good manufacturing practices”. Everybody thinks they follow good manufacturing practices, but the FDA has a huge document that will tell you otherwise, because to them, it means something very specific. Added "The Plastics Pipeline", a company site, run by Team 1 Plastics, an injection molder in Michigan. With thousands of scientific journals being published and more arriving each year, research journals constantly struggle to make sure that they are considered as important – filled with noteworthy research and a place in which other researchers want their research published. One way to quantify this nebulous quality is with “Impact Factors”, which is the average number of times a journal’s articles have been cited in the last two years, divided by the number of articles the journal published. • It can't be compared across different disciplines as citation behavior varies greatly between disciplines. • The average number of citations per paper is not a normal distribution, but is instead a Bradford distribution, meaning that the arithmetic mean is not a valid measure. • Authors can self-cite their work and these citations are included in the impact factor. One big criticism was missed however: the impact of one article can completely skew the results. This is seen in a discussion (courtesy of "The Scientist") on new impact factors just released. 6600 citations! Ignore what that does to the impact factor; that is an incredible, higher than most people get in their entire careers. But fear not, the result is temporary for the journal. If this anomaly become more widely known, I have to believe that it will really hurt the impact of the impact factor. All sorts of wild, unexplained-in-sufficient-detail assumptions are being used in creating the table, but all-in-all it can be reduced to merely the second line: cycle time. The cycle time of the new machine is 2/3 that of the existing system (12 seconds vs. 18 seconds). Everything else is largely a wash (as presented). There is no need to do a sensitivity analysis to see how much the outcome depends on changes in the assumptions – the cycle time is clearly driving everything, meaning that if you were to buy the machine, you better hope and pray that you WILL achieve the new cycle time or you will have gained nothing. 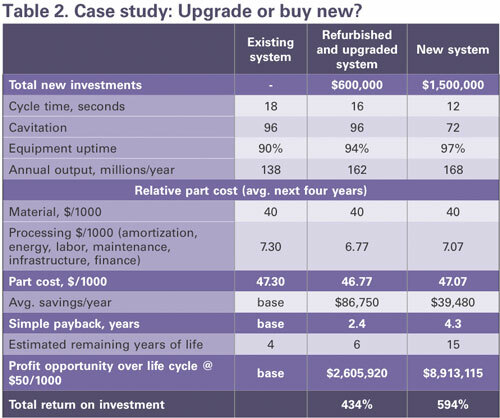 One other serious flaw is that the author completely ignores that the machine is merely one part of a larger system – higher throughput in the machine could require additional investment in machinery/labor both before and after the molding machine. Optimization of a system is achieved by global optimization and not by summing isolated local optima, something that is covered in undergraduate courses on multivariable calculus. Fortunately for IMM this was a contributed article from an equipment manufacturer trying to sell equipment and not from their internal staff, but it still reflects poorly on the magazine that such shoddy article appears within their output. 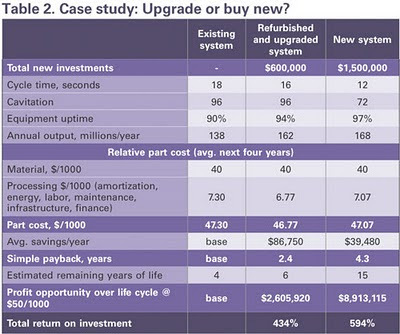 Economic analysis of equipment upgrades is far more complicated than was presented here. The simplistic analysis presented here is misleading and wrong. A “case study” would be a retrospective examination of actual events that have already occurred. Too many client visits, too many. Next week is looking much better, but we shall see. 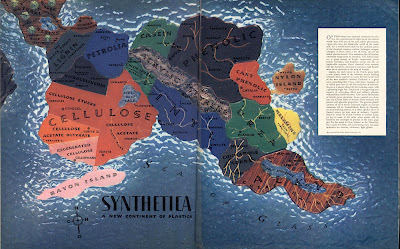 This picture of "Synthetica" has been floating around since it was first published by Fortune magazine back in 1940, and I just saw it for the first time in quite some time. You can access a larger version here. The map promotes the strange new world of plastics, trying to show relationships between the different countries. 1940 was a wonderful time to make the map as polymers were beginning to become successful, but Ziegler-Natta catalysts were still yet to be developed and so the map is totally lacking in polyolefins. Instead the map is filled heavily with thermosets (urea, phenolic, melamine...)and other materials that are still used to day, but nowhere near the volumes of the commodity plastics - olefins or PVC or PET. Even nylon is just shown as an emerging island. And despite this shortfall, people still saw this immense potential, still some 25 years or so before "The Graduate" came out. I also love the compass showing the elements N, H, C and O instead of N, E, S, and W.
That picture was drawn 70 years ago. What would be the reaction to people 70 years from now of a map of today's industry? Will the big volume olefins still be the biggest (even if sourced from non-petroleum)? Will everything be further fragmented much as PE has become HDPE, LDPE, LLDPE, UHMWPE, PEx, and PE-copolymers...? How will our ability to control structure and relationships within and between individual molecules change what can be achieved, even with something as simple as PE? Wiley Interscience is starting a debate  in Plasma Processes and Polymers and wants everyone to get involved. The topic is the macroscopic polymerization kinetics in plasma reactors - basically a variation on the Arrhenius equation. Here's the setup: Dirk Hegemann of EMPA (Eidgenössische Materialprüfungs- und Forschungsanstalt, aka the Swiss Federal Laboratories for Materials Testing and Research) published a paper last year proposing one relationship; Robert Short and David Steele of the Mawson Institute, Univ. of South Australia, looked at his data and proposed an alternate (set of) relationships. Wiley saw this and proposed the square off. Both groups are being quite good-natured about the debate: they have a joint commentary in the journal about the issues and are looking forward to getting the issues resolved . Wiley is open to taking comments from anyone. The journal cited above has the article of Short and Steele, a reply from Hegemann, and two perspectives from a "Physicist's Point of View" and a "Chemical Engineering Point of View", all open access. So don't just sit there. Download the papers, run through them (they are not overly technical - there are only a few simple equations that any undergrad can handle), create some great ideas and put them out there. Or at the very least, pull up a chair and watch something that doesn't come along very often at all. Actually, Wiley didn't start the debate but is providing a forum for it, including open access. Isn't that how science is supposed to work? The New York Times has nice illustrations of what has been tried. This blogger comments on the relative size of the oil spill compared to other spills both accidental and deliberate, and along the way comments on how to not plot your data, a long running theme in here. Last week I wrote about the theft of resins trucks in Mexico. Now comes this report of theft of natural gas condensate, the byproducts of natural gas purification consisting of heavy hydrocarbons (both linear and aromatic) and various sulfur compounds. "...Pemex says that since 2006, it has had $300 million worth of natural gas condensate, a liquid hydrocarbon byproduct of natural gas production, stolen from its Burgos Field in northern Mexico. At times, Pemex says, thieves took in as much as 40% of the condensate production from the field, raiding 52 transfer and delivery systems spread through the area. They also hijacked condensate shipments at gunpoint." Again, I'm flabbergasted that anyone would steal such low grade chemicals, particularly if force is needed. Andrew Sun in his blog at nature.com comments on the Journal of Polymer Science, Part B: Polymer Physics [*], its lack of impact and polymer physics in general, most of which I am puzzled by. "Somewhat coincidentally, RSC launched a new journal Polymer Chemistry this year, whereas there has been no new journal for polymer physics. These are some loose evidence of the declining of polymer physics research I have long felt about." But the RSC launched "Soft Matter" back in 2005 and that journal is doing quite well. Certainly the journal is not purely about polymer physics, but when the first word in the title is a physical descriptor, it is hard to state that physics is being ignored. If the impact factor is not keeping up with its sister journal, I would look for alternate reasons, not that the subject is dying. What is most surprising about the conclusion is that the largest applications for polymers are for their physical properties, not their chemical properties. To suggest that polymer physics is dead is akin to that famous patent examiner that stated that everything was already invented and the patent office should think of closing down. [*] I know, what a mouthful for a title. The journal originally started as just the Journal of Polymer Science, but got so big that it was split into a chemistry part and a physics part. For a while, there even used to be a Part C: Polymer Letters Edition. I remember as I was published in both Parts B and C. Yes, I am that old. Blogger was down most of down on a regional basis, but appears to be back. All but a handful of our clients are secret. As is the nature of the work we do for them. In the contracting business [*], this is the modus operandi. When people initially start working for us, they view the secrecy as a detriment - they feel it would so much easier to obtain new clients if we could talk about the clients that we already have, clients that are huge, well respected, leaders in their industries... This is short sighted however, in that while the name-dropping may initially make an impression on the potential client, that client also quickly realizes that soon enough their name would be used to gain some other client, something that would be great for Aspen Research, but of no value to the name-dropped client. At the same time, the need for confidentiality about what we are working on is much better understood. As one of our former leaders said, we get to work with the crown jewels of a client's business. If the problem wasn't important, they wouldn't be hiring us. Being owned by a larger corporation also presents additional challenges for us. We keep quite a distance from them both physically (i's 14 miles to their buildings) and structurally - their ID cards won't allow them access to our building and vice versa. We are not part of their R & D structure, but a separate entity that reports to the COO. We don't tell them what we are working on or who we are working for. The only restriction that they have on us is that we can't work for any of their competitors. [*] Note that I said contracting business. We are NOT consultants - we work for a living. Not the Czech band that brought down a government, but Czech laundry detergent bottles. This artist took one such bottle, cut out a mouth, added some details and photographed the result. Plasics News reported last week that the Mexican government is going to be cracking down on the stealing of resin trucks. "There’s been a resins black market in Mexico for many years...Gangs attack the trucks and steal the resins. It happens every month...It may be as much as 1,000 metric tons a year." Who knew? But resins? Most are only worth a dollar or two and you would certainly get less on the black market. Why not steal something of greater dollar density ($/cm3) like pharmaceuticals? Quick Link: The Rheol World discusses dripless popsicles - ideal for toddlers and anklebiters. I wish I would have had some when my son was of that age. I could see them being useful in the Space Station as well or when I get a few years older and make those final turns in the circle of life. While the Deepwater Horizon leak is large, it is surprisingly not that much larger than leaks that naturally occur. From "The Oil Drum"
The Deepwater Horizon site releases 3 to 12 times the oil per day compared to that released by natural seeps across the entire Gulf of Mexico. Only 3 - 12 times - assuming that there finally is a good estimate of the Deepwater Horizon leak. I'm not trying to minimize the Deepwater catastrophe, as it truely too much oil, arriving too fast and all in one location. And it ain't done leaking yet. But it is still striking that a very large amount of oil is naturally present in the oceans. As a former bicycle racer, I strongly advocate helmet use. Having been in many frightening crashes, I can firmly state that I wouldn't be here if I hadn't worn one all those years ago, OR maybe I would still be here, but in a greatly reduced mental capacity. (I know, you're all saying how much lower can I go anyway!) I cracked many of them and banged plenty of others hard enough to be unsure of their future effectiveness. Rather than take a chance, I would just buy a new one. That may no longer be necessary in the near future. Developers at the Fraunhofer Institute for Mechanics of Materials in Freiburg have added a layer of microencapsulated oils which stink when released. This could be quite effective as long as the oils don't smell anything like sweat. Heavily used helmets already have a "bouquet" from all the sweat absorbed in the helmet's cushioning pads. And maybe some of the energy drink that you poured over your head thinking that it was your water bottle. If you've been having problems getting my posts today, you're not alone. I'm guessing it is the problem of the operator rather than the software. Too much trouble for only two posts. I never knew that plastics could be bought/sold/speculated upon in the futures markets, much as petroleum, pork bellies and other commodities are. I am still having a hard time processing the idea, as polymers are, at least in my mind, difficult to commoditize. It certainly can be attempted - I know the MFI is the key factor in many PE and PP purchases, but given that the values vary extensively, I find it hard to believe that there is a large enough volume for a futures market at any one give MFI value. People that buy a '2' are not interested in a '10' and vice versa. The enticing idea of these is that they are paper only markets - you're not going to actually have to take delivery of a railcar of resin pellets. A true investment opportunity in plastics, something to make biologists green with envy (pun intended) as there isn't a futures market in e. coli or listeria. Which come to think of it, isn't a bad comparison either. Any papers published in microbiology using a certain microbe will list in the experimental details section the ATCC strain number as there are enough differences within any microbial genus and species to make the strain an important consideration. Composites World has a short write-up showing a terrific example of the work my company does in the area of artificial weathering, accelerated aging and product life prediction. You can also see one who one of our clients is, something that is normally kept secret per the wishes of the client . We do far more work in polymers, metals and material science outside of accelerated, but it is an area that historically we have done quite a bit in, particularly for another client, our parent corporation, Andersen Windows . To badly paraphrase that old chestnut from "Top Gun", I could tell you who are clients are, but then I'd have to hire you. How about that? Now you know another client! Waylon Jennings did it with having a "4-car garage and still building on", while my wife and I discovered this weekend a new way to do it: twist your foot hard and get a "Jones Fracture" - a break in the outermost metataursal bone in your foot. If you have a choice, it's preferable to create the fracture in the left foot as then you can still drive yourself.